Myers MG et al. : Conventional versus automated measurement of blood pressure in primary care patients with systolic hypertension: randomized parallel design controlled trial.BMJ 2011; 342:d286. To compare the quality and accuracy of manual office blood pressure and automated office blood pressure using the awake ambulatory blood pressure as a gold standard. Multi-site cluster randomized controlled trial. Primary care practices in five cities in eastern Canada. 555 patients with systolic hypertension and no serious comorbidities under the care of 88 primary care physicians in 67 practices in the community. Practices were randomly allocated to either ongoing use of manual office blood pressure (control group) or automated office blood pressure (intervention group) using the BpTRU device. The last routine manual office blood pressure (mm Hg) was obtained from each patient’s medical record before enrolment. Office blood pressure readings were compared before and after enrolment in the intervention and control groups; all readings were also compared with the awake ambulatory blood pressure. Difference in systolic blood pressure between awake ambulatory blood pressure minus automated office blood pressure and awake ambulatory blood pressure minus manual office blood pressure. 1. Gregory Y H Lip: Change Page: Don’t add aspirin for associated stable vascular disease in a patient with atrial fibrillation receiving anticoagulation. BMJ: 2008; 336: 614. 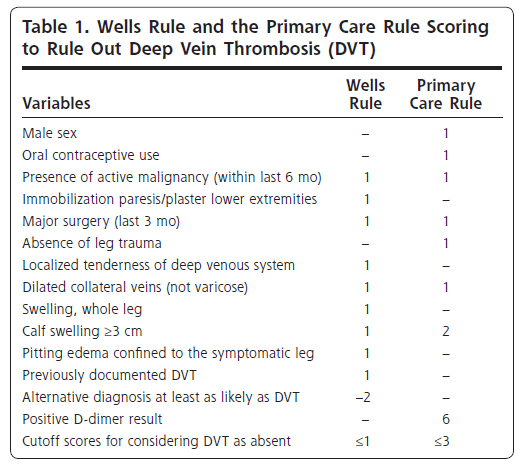 1.The Wells rule has 10 items including one ‘subjective’ item: Alternative diagnosis at least as likely as DVT(or, Wells rule is influenced by pretest estimate of the clinician) If score is more than 1, ultrasound is indicated regardless of the result of D-dimer testing. If score is 0 or 1, ultrasound is indicated if D-dimer test is positive. 2.The primary care rule has 7 items(with no ‘subjective’ items) and D-dimer testing. If the score is more than 3, ultrasound is indicated. If the score is 3 or less, ultrasound is indicated if D-dimer test is positive. The objective was to compare the Well’ rule (Table1) and the primary care rule (Table2). 2.The ability of both rules to efficiently reduce the number of referrals for leg ultrasound investigation that would result in a negative finding. A.Study design; Prospective cohort study without control group. 1. Family physicians collected data on 1,086 patients to calculate the scores for both decision rules before leg ultrasonography was performed. Patients with 1 or more of the following symptoms were enrolled: swelling, redness, or pain of the lower extremity. between the 2 rules in the number of missed diagnoses and the proportions of patients that needed ultrasound testing. Data from 1,002 eligible patients were used for this analysis. 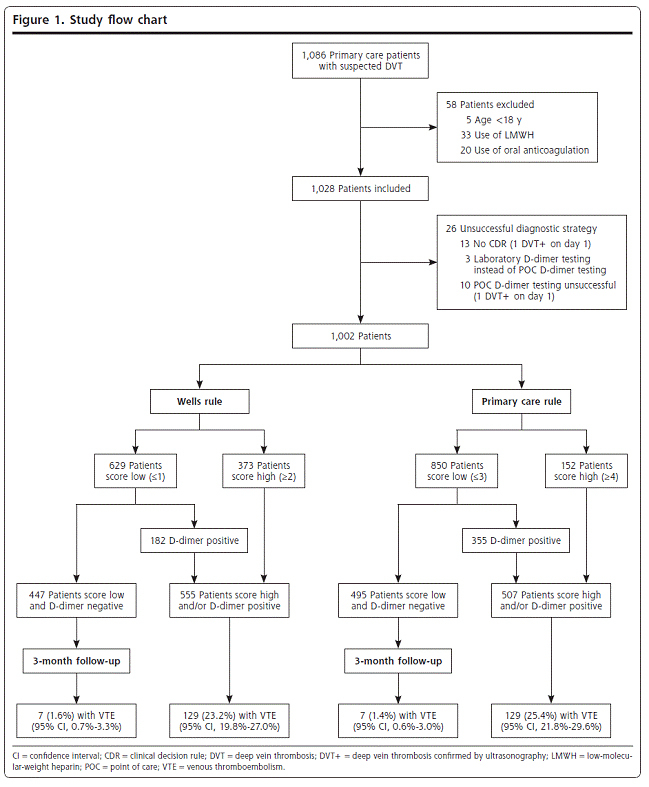 Of 1,002 patients, 136 (14%) had DVT confirmed by objective testing. Three patients were lost to follow-up. 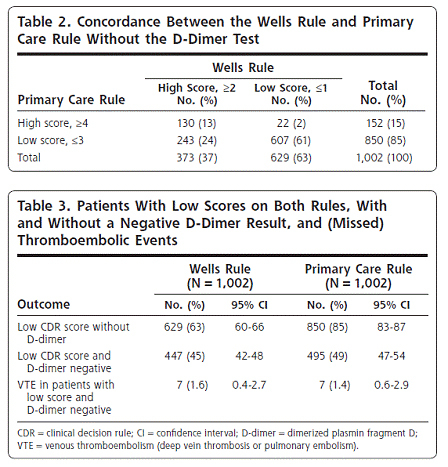 A venous thromboembolic event occurred during follow-up in 7 patients with a low score and negative D-dimer finding, both with the Wells rule (7 of 447; 1.6%; 95% confidence interval [CI], 0.7%-3.3% ) and the primary care rule (7 of 495; 1.4%;95% CI, 0.6%-3.0%). Fewer patients (22%) need D-dimer testing when using the Wells rule, but 4% more will have to be referred for compression ultrasonography. Expressed differently, to save 1 referral for compression ultrasonography, an additional 5 or 6 D-dimer tests have to be performed when using the primary care rule. Schmidt HG, Norman GR, Boshuizen HP: A cognitive perspective on medical expertise: theory and implication. Acad Med. 1990 Oct;65(10):611-21. Murray J.Favus,M.D: Bisphosphonates for Osteoporosis. N Eng J MED 363;2027-35, 2010. Estrogen deficiency after menopause is the most common cause of osteoporosis, but secondary causes must be ruled out before treatment is undertaken. Common Secondary Causes of Osteoporosis are Vitamin D deficiency, Primary hyperparathyroidism, Celiac disease, Idiopathic hypercalciuria, Hyperthyroidism, Myeloma. Osteoporotic hip fractures are associated with the highest morbidity and mortality. Up to 50% of patients with such fractures have permanently impaired mobility, and 25% lose the skills necessary to live independently. The rate of death from any cause is increased by a factor of 5 to 8 during the first 3 months after a hip fracture. Estrogen deficiency due to either spontaneous or surgical menopause activates osteoclast and accelerate bone resorption. Bisphosphonates disrupt the attachment of osteoclasts to the bone surface, and stop bone resorption. Alendronate and risedronate and zoledronic acid are effective to prevent hip fracture and vertebral fracture. Randomized, placebo-controlled trial of pamidronate has not been performed with sufficient power to assess the efficacy of the drug for the treatment of hip fracture in women with postmenopausal osteoporosis. All postmenopausal women with measurements of bone mineral density at either the spine or the hip that meet World Health Organization (WHO) criteria for osteoporosis (T score of less than −2.5) should receive long-term therapy with an agent that has been proven to prevent fractures. fracture (hip, vertebral, humerus, or fore-arm) or of a hip fracture alone in patients who have not yet begun therapy. In general, the author initiates pharmacologic treatment in patients who have a 10-year probability of a hip fracture that exceeds 3% or a 10-year probability of a major osteoporotic fracture that exceeds 20%. Raloxifene decreases the risk of vertebral fractures, but it may not reduce the risk of nonvertebral fractures. Calcitonin has limited efficacy in reducing the risk of vertebral fractures and lacks efficacy in preventing hip fracture. After initiating bisphosphonate therapy, this author typically reevaluate the patient in 1 month to assess tolerance and thereafter at 3 months, 6 months,and 1 year. At 3 months and 6 months, he obtain measurements of bone-turnover markers, such as osteocalcin or serum C-terminal telopeptide of type 1 collagen (CTX). At 1 year, and every 2 years thereafter, he repeat the assessment of bone mineral density with the use of DXA. Erosive esophagitis, ulceration, and bleeding, heartburn, chest pain, hoarseness, and vocal-cord irritation, transient renal toxic effects, osteonecrosis of the jaw, etc. The optimal duration of bisphosphonate therapy remains uncertain. Recent retrospective studies and case reports suggest that long-term bisphosphonate therapy may result in the suppression of bone turnover and confer a predisposition to increased bone fragility, with an increased risk for atypical femur fractures. After 5 years of treatment, this author would decide whether a drug holiday might be appropriate for this patient, taking into consideration the fact that she is at high risk for recurrent fracture.